Avene Cicalfate Repair Cream | £7.50 // Meg raved about this a couple of months ago and since I usually love what she recommends, I thought I'd give it a try. Think of this as a better version of sudocrem. It's a multi-use product that can be used for pretty much anything and everything. I mainly use it on pesky spots when I want to get rid of them but don't want to use anything too harsh and irritate my sensitive skin any further. It also works really well on eczema flare ups. 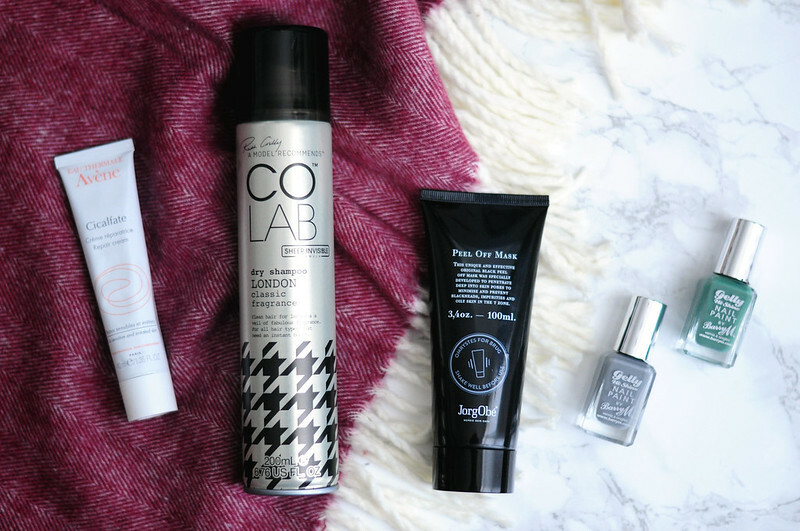 COLAB London Dry Shampoo | £3.50 // I don't use a dry shampoo on a regular basis but for some reason my hair has been getting oily quicker than usual and this has been a life saver towards the end of the week. I love the dry shampoos from COLAB as they come in two sizes and are a great price. They refresh my hair without feeling like I have any product in my hair and without leaving a white cast in my hair. The scent of London is bergamot, musk and magnolia. JorgObé Peel Off Mask | £22 // This month I've remembered how much I liked the JorgObé Peel Off Mask when I first tried it last year. After trialing it and writing about it, I put it to the back of my skin care cupboard after trying some other products and it stayed there forgotten. I've been using it once a week this past month on my t-zone to remove blackheads and to keep my skin looking clearer. You apply a layer and wait thirty minutes or so until it dries and you're able to peel it off completely. Barry M Gelly Nail Paint in Cardamon & Chai | £3.99 // I bought these two nail polishes the other month and I really love them. Although not particularly summery colours, they've been what I felt like wearing. I can't get enough of the Barry M gelly polishes, so so good!